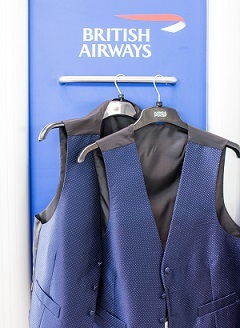 Around 300 passengers bound to Moscow on British Airways flights from London have picked up free waistcoats in tribute to England football coach and fashion icon Gareth Southgate. London to Moscow travellers today and yesterday are being offered the complimentary garment, with 300 taking up the offer as of this morning. England play Croatia in the World Cup semi-final tonight in the Russian capital. The Marks & Spencer waistcoat being given away (pictured right) is the same as that worn by Southgate throughout the tournament. The retailer is the official supplier of formalwear to the England team, and also supplies food on BA's short haul flights. BA crew do not wear M&S, however; their uniform is designed by Julien MacDonald. M&S has also attempted to capitalise on the unlikely fame of the item, running a large tactical advertising campaign this week using the hashtag #luckywaistcoat. #WaistcoatWednesday was trending on Twitter this morning, with a number of England fans turning up to work in waistcoats in support of their team. At Heathrow today BA staff have also supplied England flags and painted the St George's cross onto the faces of fans, while children at the airport were encouraged to take part in football matches with inflatable footballs and goalposts. Supporters were also offered special boarding passes bearing the destination 'Home' and the name 'Football'. BA runs three services a day to Moscow, it said in a release.